Experience unforgettable fine art prints with dual view eco light technology! Dual-view paintings are high-resolution printings that absorb light during the day, then emit a calming low-light glowing effect at night, giving you two completely unique pieces of art in one. A great conversation starter, each print automatically recharges with luminous energy with natural or artificial light. Beautiful in its own right, a mere 25 minutes of exposure to light makes your stunning print reveal a whole new viewing experience. Children especially love our gorgeous canvases in their bedroom because they act as a gentle, natural and peaceful night light to help them fall asleep. They?re also great for low lit areas on your home or office, providing just enough light to walk comfortably in the dark. Each exclusive art piece has been crafted to enhance your room ambiance and the visual comfort of you, your family and visitors. It?s the best canvas wall art for those that love inspiration pieces that look amazing both day and night! Also Check Out:Don?t forget to search for our other popular canvas prints, wall murals and glass wall art! Adorn your home, office or patio with gorgeous art prints that offers a high-definition illuminated design you have to see to believe. Click ?Add to Cart? now to get yours! BEAUTIFUL PRECISION ARTWORK ? Each Startonight home art decor including canvas prints, wall murals and glass art are made in the Transylvania using both handcrafted art and the advanced Mimaki printing machine with precision detail. BOLD ECOLIGHT TECHNOLOGY ? This gorgeous fine art collection is incredible wall décor because it offers vibrant, welcoming coloring during the day, and up to 8 hours of soft glow-in-the-dark luminescence at night. ENHANCED WALL COVERAGE ? 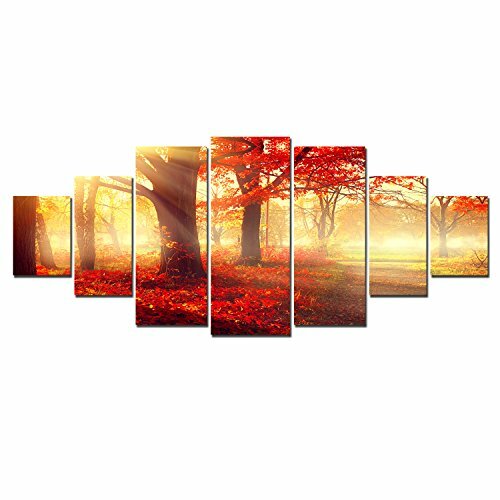 Fine art comes in many forms and none are more versatile, unique and artistic than this 7-piece wall canvas set ( 2 pcs x 30 x 40, 2 pcs x 30 x 60, 2 pcs x 35 x 90, 1 pcs x 100 x 40 cm). Place them together to capture the full essence of this contemporary, inspirational landscape. INDOOR/OUTDOOR VERSATILITY ? Though not weather resistant, the eco-light and dual view technologies still work effectively when added to an enclosed patio or covered deck area. Enhance your backyard decor and style! PRE-FRAMED EASY INSTALLATION ? The entire Startonight art collection is pre-framed with real wood for easy hanging and installation. Art paintings are securely packaged during shipping, so please reach out if there?s a delivery issue. If you have any questions about this product by Startonight, contact us by completing and submitting the form below. If you are looking for a specif part number, please include it with your message.